REDWOOD PARK – Ever wanted to spend your day bungee jumping or playing miniature golf in Redwood Park? You are not alone. 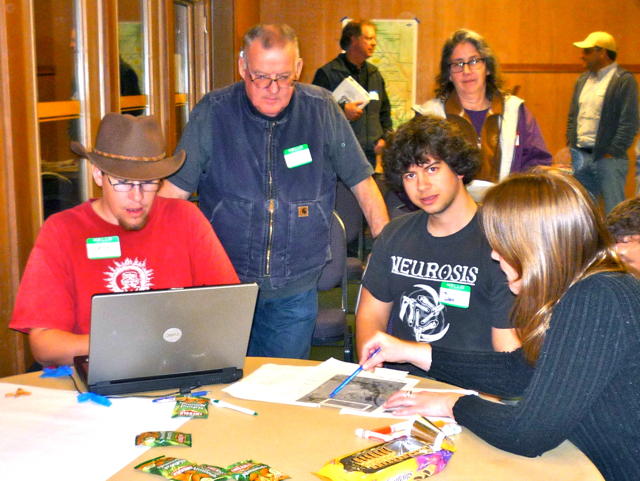 Those ideas and many more were brought up during the Public Visioning Workshop for Redwood Park held by the City of Arcata Thursday evening in the Redwood Lodge. The workshop, an effort to gather input on the community needs and interests at Redwood Park, was attended by more than 30 community members. Students, business owners, neighbors and park aficianadoes joined City planners and Parks & Rec Committeemembers to brainstorm ideas in an effort to update the Redwood Park Master Plan. Parks Superintendent Dan Diemer stated that the playground, which is more than 15 years old, is due to be replaced in the next two years depending on funding. A portion of the meeting was to devoted to gathering ideas for revamping the playground. Participants broke into to small groups led by Humboldt State student faciltators to compile ideas. An overwhelming request was more bike love: bike racks; small bike skill park; a competition level mountain bike course; and even a bike hostel were all brought to the table. Ideas spanned the spectrum. Add more parking or ban cars outright. Allow evening concerts – no, keep the park quiet. Get rid of 4/20 festivities or charge for the 4/20 event with use of wristbands. Keep people from camping – but could we allow Boy Scouts to camp in the park? Despite the different desires, the mood was good and no one was berated for their ideas. A few people gasped at the suggestion of banning drumming from the park – one man looked aghast at the very thought – but all ideas were noted. Sara Moon, a mother of three, would like to see a covered play area so children can still have a place to climb and play during rainy days. “Our only option is going to Eureka Mall, it would be nice to have something here in Arcata,” she said. Committeemember Nancy Stark would like to see adult playground fitness equipment added to the park. This entry was posted on Monday, February 13th, 2012 at 7:08 pm	and is filed under News, Environment. You can follow any responses to this entry through the RSS 2.0 feed.